In 1487, Mahmud Begada, the grandson of Ahmed Shah, fortified the city with an outer wall 10 km (6.2 mi) in circumference and consisting of 12 gates, 189 bastions and over 6,000 battlements. 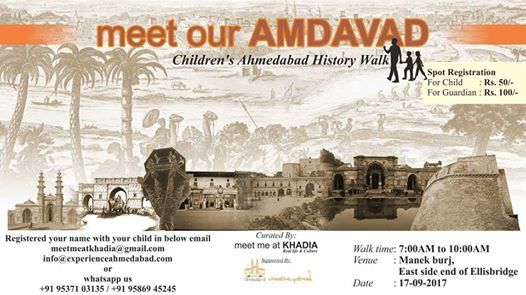 Ahmedabad remained the provincial headquarters of the Mughals until 1758, when they surrendered the city to the Marathas. A military cantonment was established in 1824 and a municipal government in 1858. In 1864, a railway link between Ahmedabad and Mumbai (then Bombay) was established by the Bombay, Baroda, and Central India Railway (BB&CI), enabling traffic and trade between northern and southern India via the city. The Indian independence movement developed roots in the city when Mahatma Gandhi established two ashrams — the Kochrab Ashram near Paldi in 1915 and the Satyagraha Ashram (now Sabarmati Ashram) on the banks of the Sabarmati in 1917 — which would become centers of nationalist activities.